With car sales dropping across Europe, the bicycle is becoming the preferred mode of transport for almost every member state, according to new research. 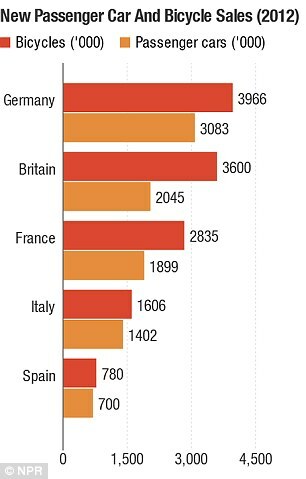 More bikes were sold in Italy last year than cars, which is the first time that's happened since the Second World War. Closer to home, a total of 3,066,000 bikes were bought in the UK in 2012, compared to just 2,045,000 passenger cars. This may be due to a number of initiatives in the UK that promote cycling, including the government-based Cyclescheme, that lets people buy bikes at a discount and tax-free. The Romanians were found to be the biggest bike lovers in Europe as bicycles outsold cars five to one. Researchers, including NPR’s Lauren Frayer found that the trend has even been seen in the car-loving country of Spain, where bikes pushed out sales of cars for the first time ever. Frayer compared bicycle and car sales across the 27 member states of the European Union. Cyprus and Malta were immediately discounted because new-car registration data wasn't available. The only countries in which the trend wasn't seen were in Belgium and Luxembourg, where cars continued to outsell bikes. According to Krishnadev Calamur: 'The data can be explained by the slump in car sales across Europe and this decline coincided with the worldwide recession'. Research from the European Automobile Manufacturers Association found in July that new vehicle registrations dropped by 6.3 percent in June. This brought total sales for the first six months of 2013 to just 6.44 million, which was a 6.7 per cent drop year-on-year. The UK was the only country to see a rise in car sales up to that point, rising by 10 per cent, while Germany and France dropped by 4.7 per cent and 8.4 per cent, respectively. ← Wind Power Has Dramatically Cut Global Warming Pollution In The U.S.